Pumpkin pancakes with fresh blueberries and warm syrup create a weekend breakfast worth waking up for. 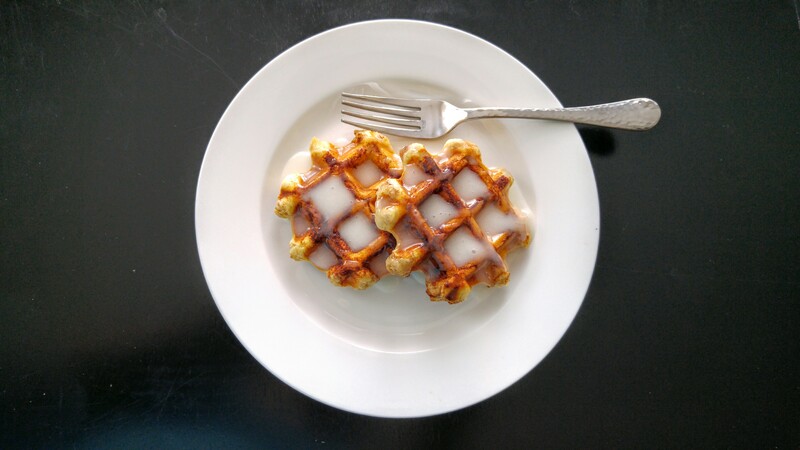 Cinnamon Roll “Waffles” make a quick & surprisingly good breakfast. I’ve never been one to show a lot of interest in food trends or new kitchen gadgets, but there’s one craze on food TV lately that’s got my attention. 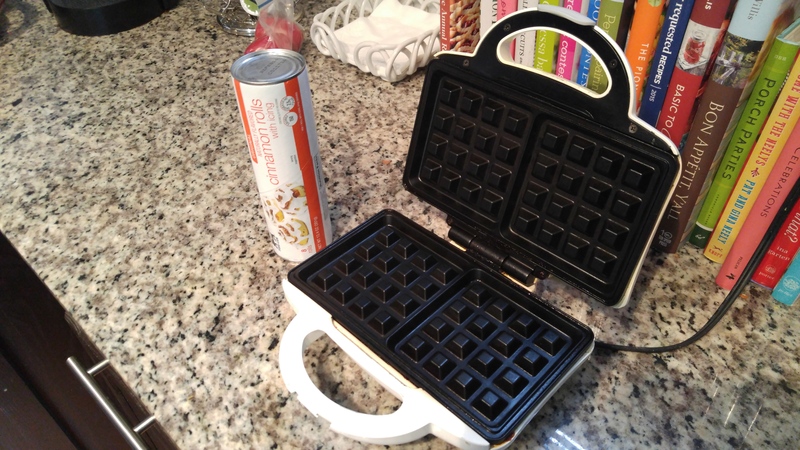 For all intents and purposes, we’re going to call it The Waffle Iron Movement. Have you seen the chatter? Evidently, the waffle iron, that little machine we plug into the wall to make fluffy buttermilk waffles, is capable of so much more. I’d like to preface this post by saying today’s “recipe” requires zero cooking ability. 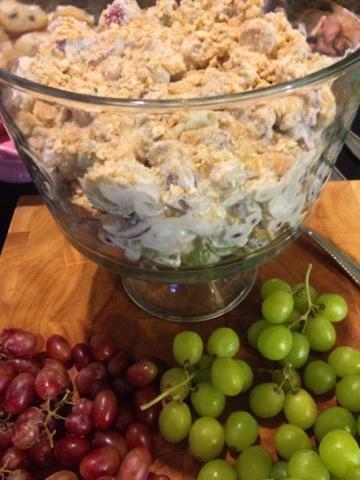 The Food Network’s Sunny Anderson taught me this trick while I was watching The Kitchen earlier this week. 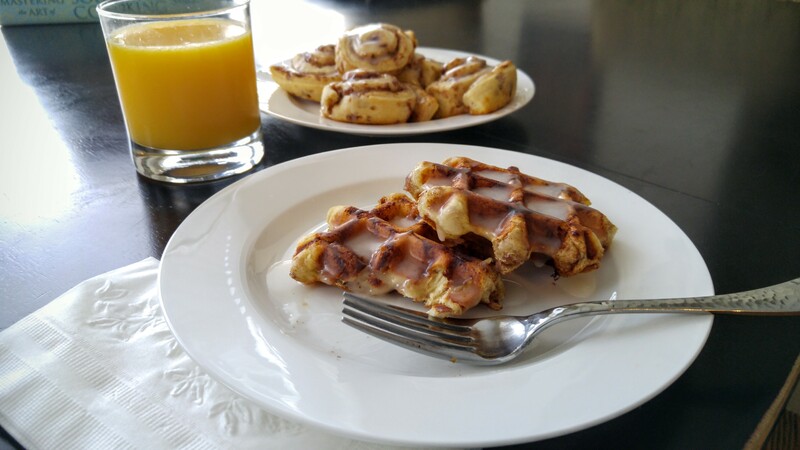 As they say on the show, “I tried it, and I liked it!” Essentially, the waffle iron can cook cinnamon rolls in less than half the time it takes to cook them in the oven. And yes, the waffle iron cooks them all the way through. Pop the cinnamon rolls on a greased waffle iron, and shut it. Simple. When cooked, the cinnamon rolls take on a crunchy exterior and remain tender on the inside. It’s amazing how this works! 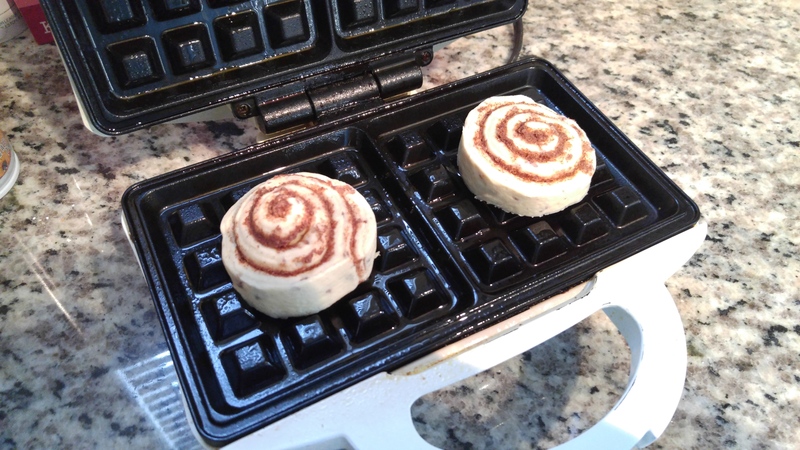 While the cinnamon rolls are cooking, rest the icing packet on top of the waffle iron to loosen it up! Add about a tablespoon of half and half to the packet and work it in with a spoon until the consistency is drizzleable. 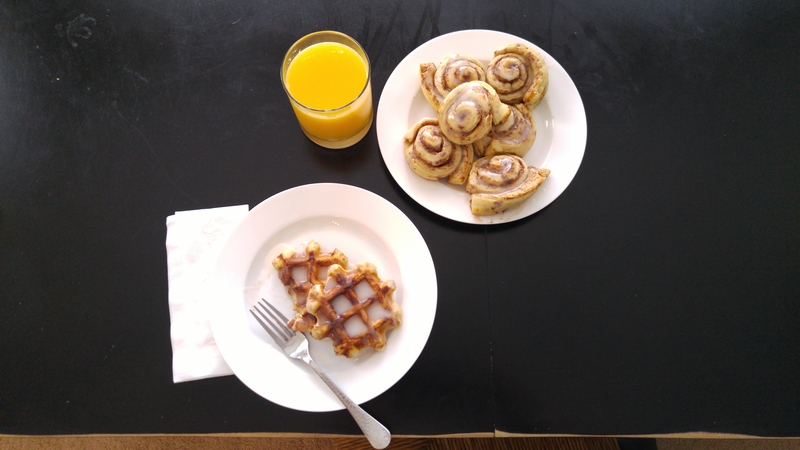 In less than two minutes, you have crispy, cinnamon roll “waffle” goodness. How’s that for breakfast on-the-go? Golden brown with great texture, you don’t even have to worry about the dough oozing out from the sides of the waffle iron. Clean up is easy! Allow the icing to serve as your syrup. They look and taste like real waffles. Ideal for college students in a dorm room, or apartment dwellers with galley kitchens, this trick is super fun. Plus, using an appliance to create something it wasn’t designed for makes me feel like a true rebel. I’m living on the edge these days. Now, I’m not saying this idea trumps the good ol’ cinnamon roll every time. There’s not too much that can replace the soft, ooey-gooey pleasure that a properly cooked cinnamon roll elicits. But, if you’re in a hurry (and who isn’t in the mornings? ), this trick is worth the minimal effort. Are you likely to try it? While that waffle iron is hot, you may want to try Bobby Flay’s Peanut Butter French Toast “Waffles” with Mixed Berry Sauce, or The Pioneer Woman’s Waffle Maker Quesadilla. 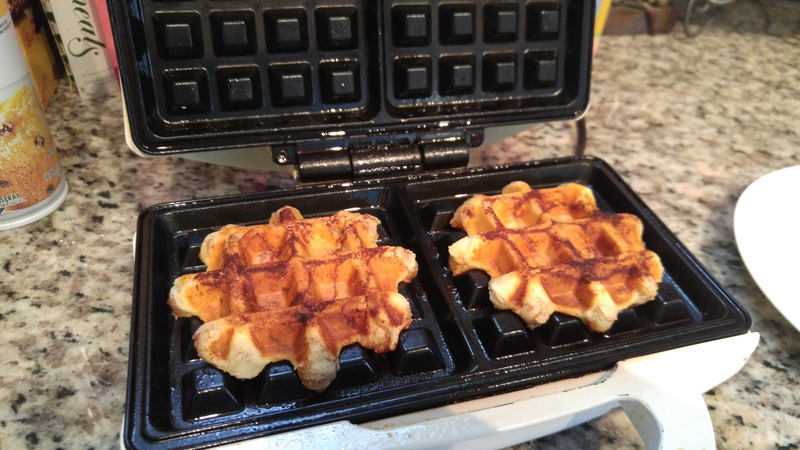 Have you used your waffle iron or another kitchen appliance for something inventive lately? Let me know in the comments below! Food tastes better when you buy local. 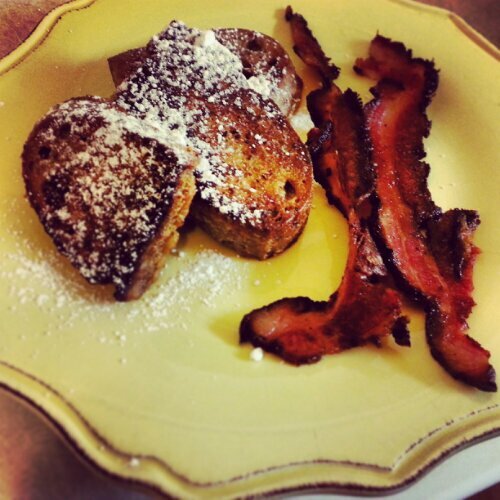 For Sunday morning brunch recently, I made french toast and bacon, but not just any french toast and bacon. On Saturday, I visited the Statesboro Mainstreet Farmers’ Market where I purchased a pecan loaf from Sugar Magnolia Bakery and Cafe and a pound of smoked bacon from Hunter Cattle Company. 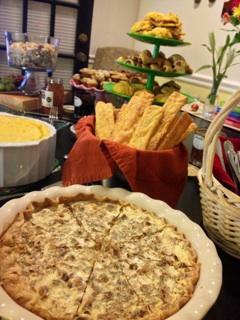 The sweet bread was the perfect thickness when sliced just right, and the Georgia pecans provided a nice crunch and texture that regular loaf bread lacks. 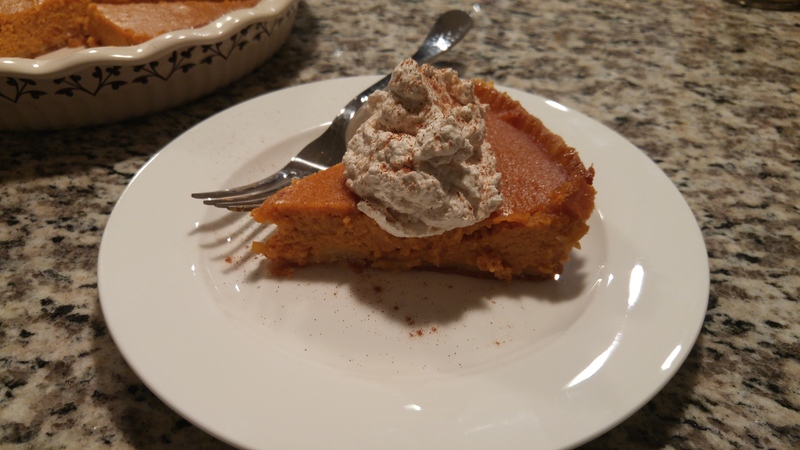 Dusted with a touch of confectioner’s sugar, it was all I could do to take one picture before I savored every bite. And the pig. Never have I tasted the flavor of hog meat so profound and assertive. Only available on Saturdays, the $4.50 pecan loaf at Sugar Magnolia Bakery and Cafe is hand-shaped into a round and baked. When the bread comes out of the oven, the top is sliced into what resembles a tree to allow steam to escape. When purchased, the bread is so fresh, you can still see the white flour on top in its brown paper sack. It’s so rustic and fun. 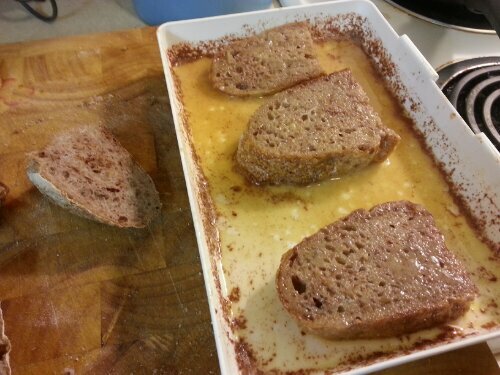 For french toast, slice the bread about a 1/4 inch thick. 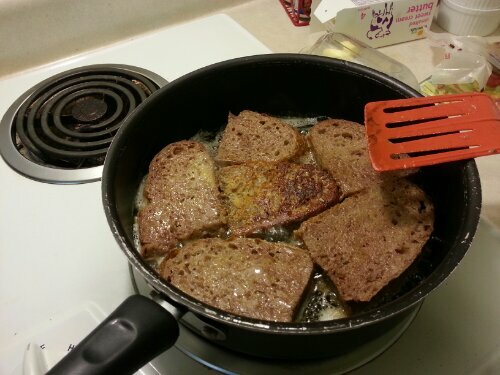 French toast is awesome for a few reasons: 1) It breaks up the monotony of pancakes and waffles, 2) Everything you need to make a batter for it is usually readily available on-hand or easy to get, and 3) It takes no time! 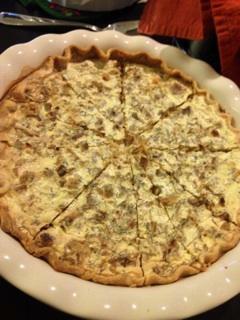 For the batter, beat two eggs, whisk in a cup of milk or half & half, cinnamon sugar and a pinch of salt. Soak slices for about 30 seconds on each side. Melt half a stick of butter in a skillet over medium heat. Toast slices about 2 minutes on each side until golden brown and beautiful like the one in the center. Flip. Repeat. Meanwhile, cook your bacon. For one pound of Hunter Cattle Company smoked bacon, you’ll pay a little less than $10, and when you think about what you’re getting, you can’t put a price tag on your health. Learn how choosing pastured pork can benefit your well-being. You’re guaranteed to taste the difference. Drizzle it with syrup or eat it without. You decide. There you have it. Breakfast locally inspired. Breakfast on vacation. It’s probably my favorite meal. 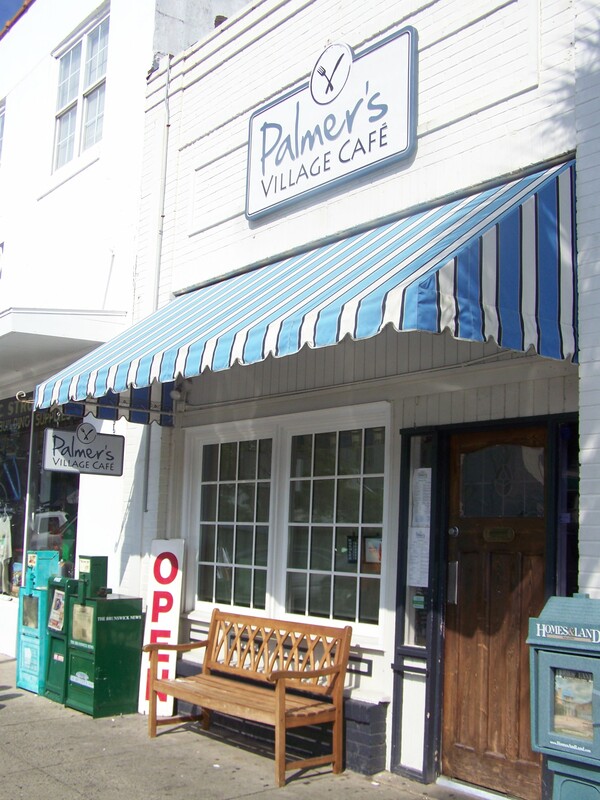 Whether you rise with the sun or sleep until 10 a.m., the food at Palmer’s Village Cafe on St. Simons Island will motivate you to get up and moving. They take pride in their ingredients and present plates with no detail undone. I’ve never been when there isn’t a crowd and that’s because, where there’s good food, you’ll find people. I appreciate the thoughtfulness of the menu items. There aren’t many places you can go to find an omelet with crab meat and homemade pimento cheese garnished with grilled, pickled okra. The dishes are regional too, like the Coastal Delight: an open-faced whole egg omelet topped with goat cheese, sautéed shrimp, spiced pecans and arugula. 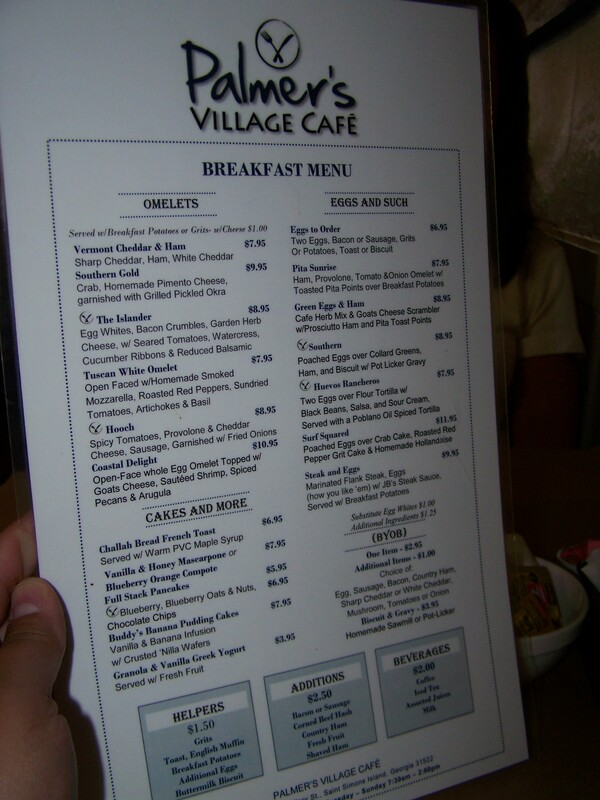 The breakfast items range from $3.95 to about $12. 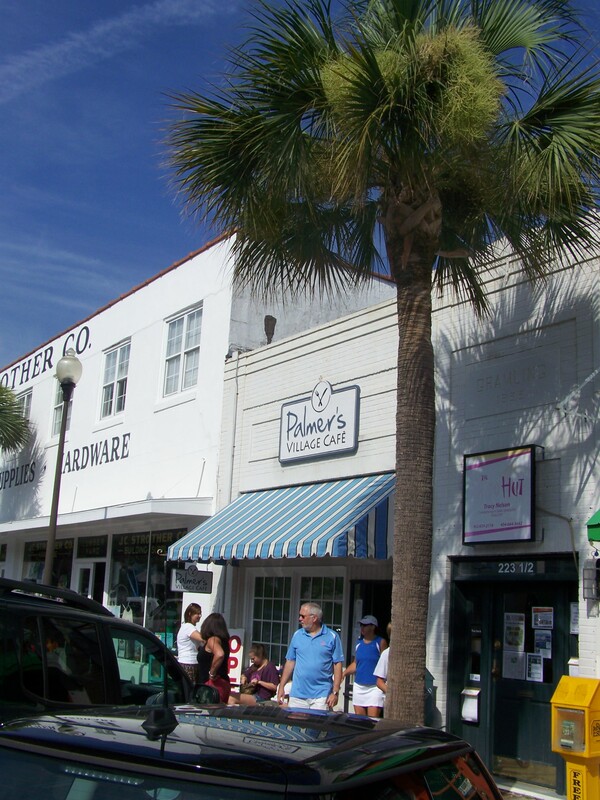 Smack dab between the Island hardware store and a small real estate company on Mallery Street, locals and vacationers fill the seats at Palmer’s. It’s my favorite place to start the day on the Island. 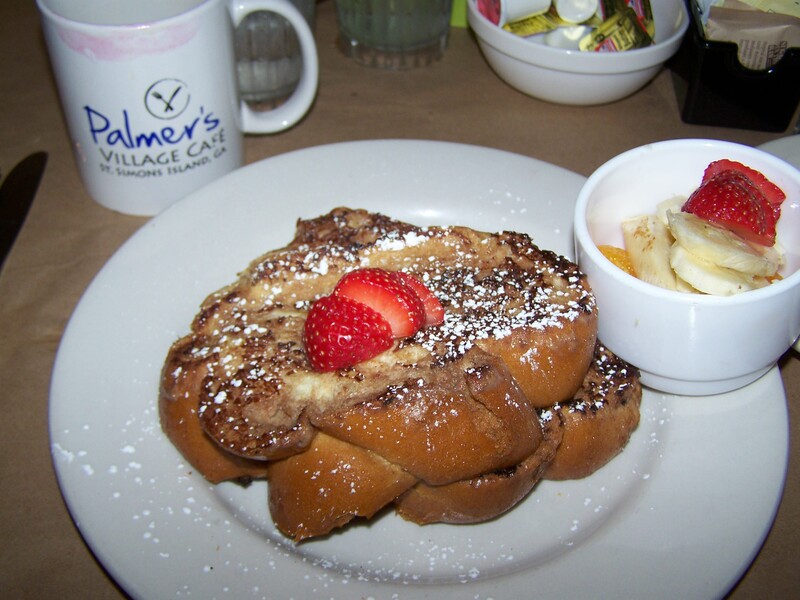 I ordered the Challah Bread French Toast served with Palmer’s Village Cafe signature maple syrup. You won’t find Aunt Jemima here. The Fresh Fruit side dish had juicy orange segments, sliced bananas and red strawberries. Now, y’all didn’t think I forgot the meat, did you? 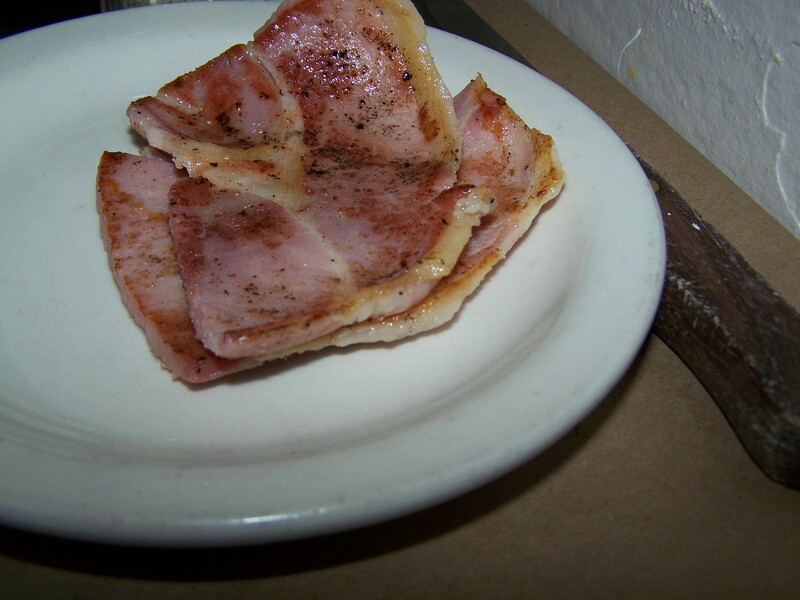 Not just bacon or sausage…country ham. 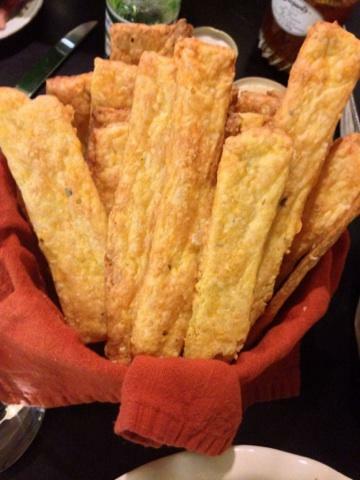 Salty and seasoned just right. That’s what I’m talkin’ ’bout! 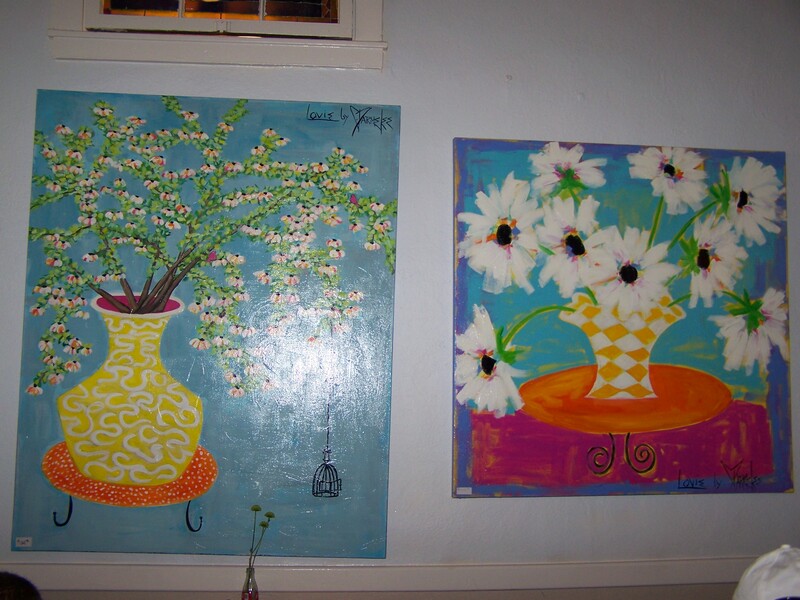 Artwork by local artist Cathie Parmelee decorates the walls and is available for purchase. This is my favorite piece. 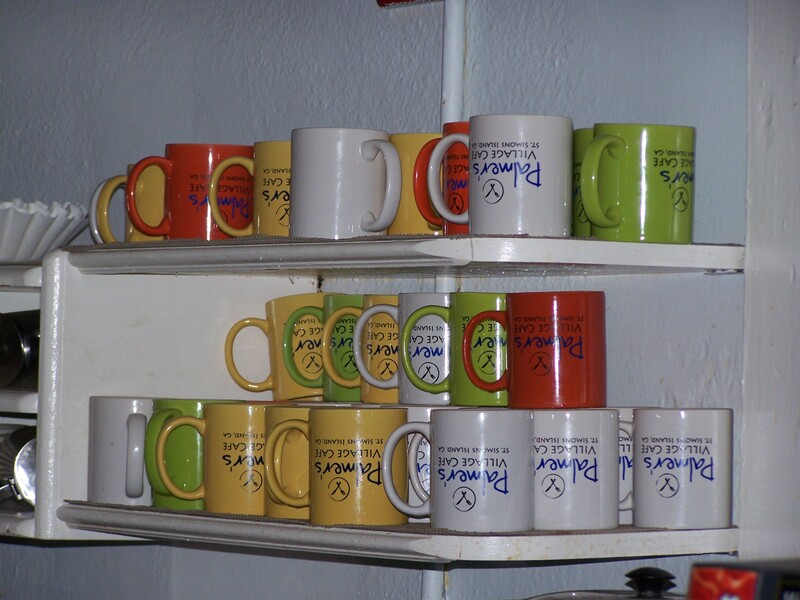 Colorful coffee mugs bring in fun pops of color. 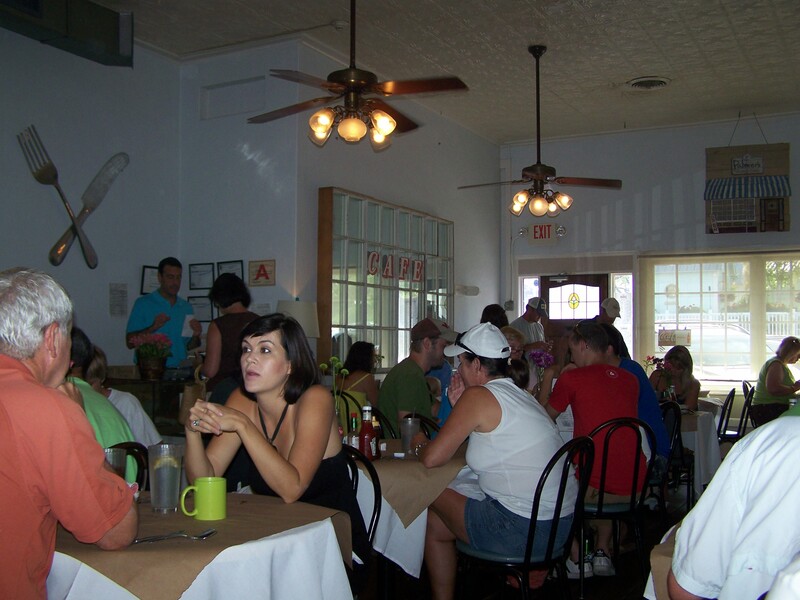 Open for breakfast and lunch Tuesday – Sunday from 7:30 a.m. – 2 p.m., you’ll feel welcome from the moment you step inside the creaking front door. 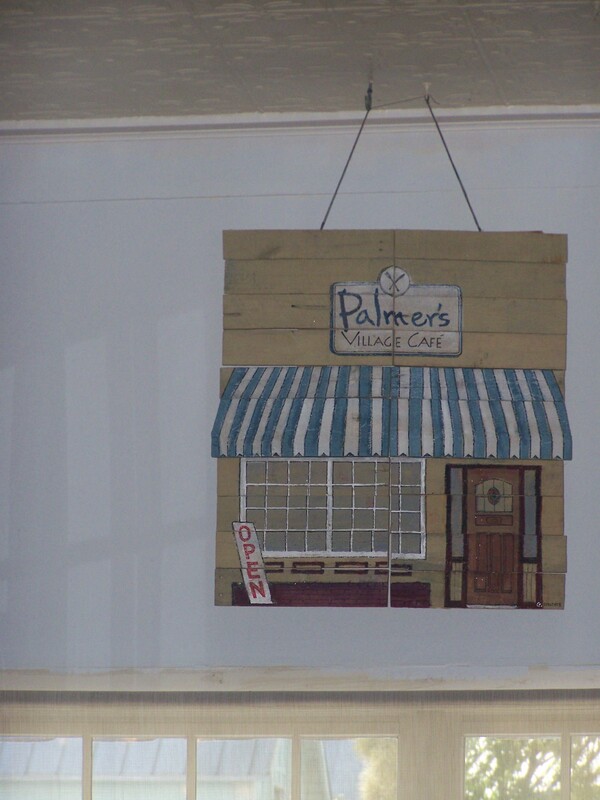 No matter how busy Palmer’s may be, the staff members will make sure your coffee cup is full and you’ve always got everything you need.